I like to serve this with brown rice and a vegetable. The picture above has my watermelon feta salad with it which was an excellent combination. -Make the marinade by mashing the garlic and 1 tsp of the salt with a mortar and pestle until it forms a nice paste. Add the cumin and turmeric and combine well. Put into a bowl and add a generous 1/2 cup of the yogurt to the bowl, set aside the shy 1/2 cup that’s left over. Combine the yogurt and garlic/spice paste well. Cut the chicken thighs into approximately 1″ cubes and put into the marinade. Set aside. -Make a side sauce by putting the reserved shy 1/2 cup yogurt into a small food processor or blender. Tear the mint leaves off of the stem and put in with yogurt. Add the other 1/2 tsp salt and some pepper. Pulse the processor or blender until it makes a fairly fine puree. You’ll see still little bits of the mint leaves, but they should be quite small. Taste and adjust seasoning as needed. -Put the chicken pieces on the skewers. If you have a gas grill, put it on high until the temperature reaches about 400 degrees. Put the skewers on the grill, close lid and reduce heat to low. Cook for 5 minutes and check to see if skewer lifts easily off grill. If it’s still sticking a lot, it’s not ready to turn yet, so cook a bit longer. Turn over and cook another 5-7 minutes until chicken is lightly browned on all sides and is tender when pierced. -Serve with yogurt mint sauce on side. 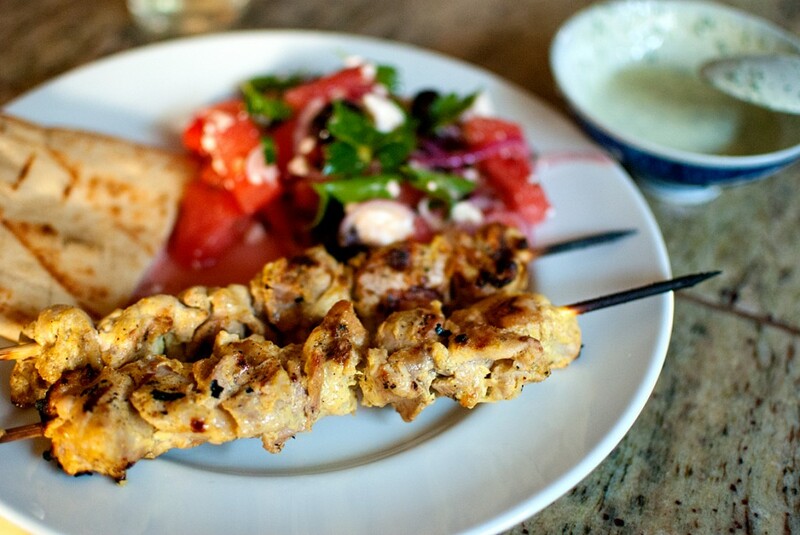 This entry was posted in main dish, Posts and tagged chicken, grilling, yogurt. Once again, many thanks for helping out with what to cook! This is frist in line……isn’t Wallingford with a view great on July 4th……. So glad to see your comment! Wallingford is perfect on the 4th and I hope you like the chicken. Let me know how they turn out!